Log Cabin Games Room – Do you need somewhere for your favourite games? A separate log cabin games room in your garden could have a lot of benefits! For a start, the favourite game such as pool, darts or ping pong wouldn’t clog up your house space, which if you are like most people is already pretty stretched! A lot of games require quite a lot of space and for most people, having to put them out and take them down is the only way to make it happen. The unfortunate realities of life means that this situation leads to us playing some of these great games very infrequently. If you have children who spend their lives glued to a computer, wouldn’t it be great to have a space which could be dedicated to games, so that they could often do something a little more physical! A log cabin games room can provide a really inviting environment to play in and somewhere that will also be very popular when you have guests in too. What should you be focusing on for your log cabin games room? Without wishing to repeat myself too much, always choose your logs carefully. I won’t say too much here, as it is well documented elsewhere on this site, but make sure you know how to choose good quality logs. To find out more, take a look at our log section. Where in your garden is most suitable to put a log cabin games room? Do you want it very close to the house, so you can keep an eye on small children? Or do you have noisy teenagers and would rather they were further away? Also think about the distance to connect to services and what sort of natural light and relationship to the sun your aspect will provide. If you are planning to play games like pool on those long dark winters evenings, then make sure you provide good lighting which will allow this. Similarly, you may need blinds or curtains to stop the sunlight dazzling you in the height of summer. Think about the predominate activities your log cabin games room will be used for. For instance, if you want to do keep fit, you want to make sure you have a high enough ceiling, so that you don’t keeping hitting it. Even playing games like the Nintendo Wii can need quite a lot of space and it is easy to bash into walls and ceilings. You need to ensure that snooker and pool tables have enough cueing space all the way around the table for a good playing experience - and no dents in the walls! Also if the cabin is a long way from the house, do you need a toilet? Would a big veranda provide other great playing opportunities in the nice weather? What about telephone and internet connections? Planning ahead with all your possible requirements now can save a headache later on! 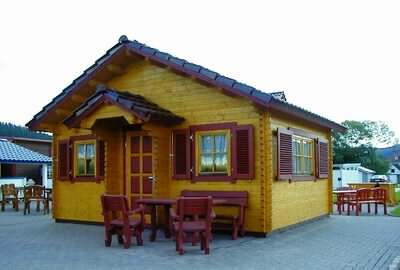 For more general log cabin advise, please see our design section. The foundations, as the name suggests, are fundamental and important. Good foundations help protect and support your investment, making it last to its’ full potential. Poor foundations, on the other hand, can lead to structural problems and can severely reduce the life of a log cabin. 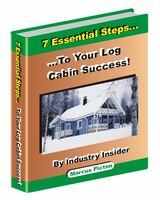 Discover more about log cabin foundations. Log cabins have many features which lend themselves to a great games room. They are very cosy and relaxing and the wood interior provides a healthy environment to spend time. The logs themselves are very robust and if there is a lot of very physical activity taking place, a few small dents to the logs will barely be noticed, unlike a big hole that could easily be created in plasterboard or dry wall. 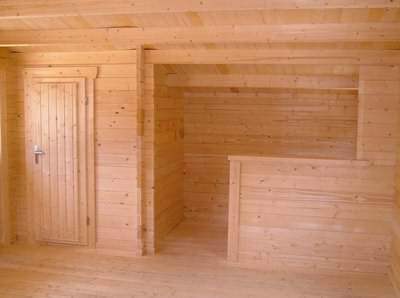 The timber is good at absorbing noise and is a very calming and natural material. The insulation properties are good too. There are other very practical advantages to a log games room you may not have thought about. The wood walls mean that it is very easy to fix a few nails or screws into - no messing around with drilling and rawl plugs! Even if you remove them later, the holes are barely noticeable and can easily be filled with a little wood filler should you wish to. Wood also does not easily show the dirt or dust, and the natural variation in colour and grain means it is low maintenance, yet still looks great. It is also a very safe environment and banging into a wood surface is much better than a hard stone surface. All in all logs are a great material for a games room.